New Release: Federico Sanguinetti and André Abath (eds. ), “McDowell and Hegel. Perceptual Experience, Thought and Action” (Springer, 2018). We are glad to give notice of the release of the volume McDowell and Hegel. Perceptual Experience, Thought and Action, edited by Federico Sanguinetti and André Abath (Springer, 2018). This book presents a comprehensive and detailed exploration of the relationship between the thought of G.W.F. Hegel and that of John McDowell, the latter of whom is widely considered to be one of the most influential living analytic philosophers. It serves as a point of entry in McDowell’s and Hegel’s philosophy, and a substantial contribution to ongoing debates on perceptual experience and perceptual justification, naturalism, human freedom and action. The chapters gathered in this volume, as well as McDowell’s responses, make it clear that McDowell’s work paves the way for an original reading of Hegel’s texts. His conceptual framework allows for new interpretive possibilities in Hegel’s philosophy which, until now, have remained largely unexplored. Moreover, these interpretations shed light on various aspects of continuity and discontinuity between the philosophies of these two authors, thus defining more clearly their positions on specific issues. In addition, they allow us to see Hegel’s thought as containing a number of conceptual tools that might be useful for advancing McDowell’s own philosophy and contemporary philosophy in general. 2. John McDowell, What Is the Phenomenology About? 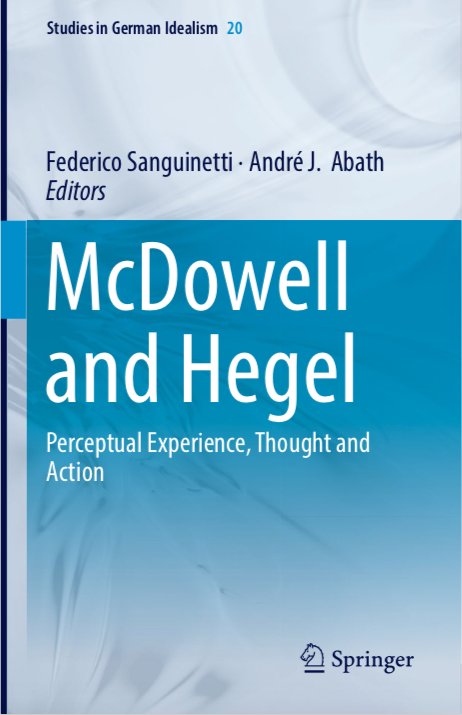 For further information, please visit the publisher’s page on the book McDowell and Hegel.